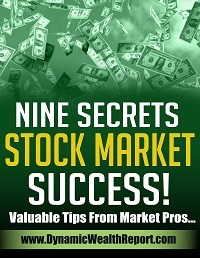 Get the highly-acclaimed Dynamic Wealth Report delivered FREE to your email inbox! Simply enter your email address below to start receiving the Dynamic Wealth Report absolutely free and without any obligation. Read by nearly 250,000 investors, the Dynamic Wealth Report has become one of the most popular investment newsletters in the entire world. Each issue is jam-packed with investment information that can make a better, more informed investor. Whether you’re saving for retirement, trying to supplement your income, or looking to become seriously wealthy, you’ve come to the right place! We cover everything from stocks to bonds, options to commodities, ETFs to dividends, personal finance, and real estate. So take a few seconds to subscribe… all we need is your email address.